Time for the next game in our 1066 campaign! After seeing off Morcar and Edwin at Fulford Gate, Harald and Tostig await the arrival of hostages at Stamford Bridge (scenario rules here). 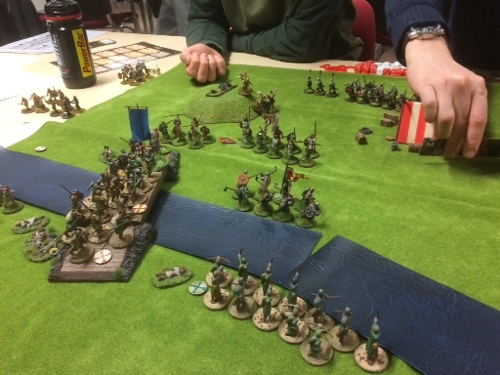 But the Northmen are surprised by Harold Godwinson's rapid reaction. Looking up from his beer, Harald scowls at the appearance of Harold's Fighting Man battle standard. Rousing his men into action, Harald quickly forms a defensive Shieldwall. But his decision to allow his men to leave their armour back at the longships may soon come back to haunt him. Word is sent for reinforcements, but will they arrive in time? Harold's attacking force quickly overcome the light defences on the western shoreline of the River Derwent. But a lone Viking Warrior stands defiant on the bridge. A small unit of Huscarls charge forwards with their Dane Axes. 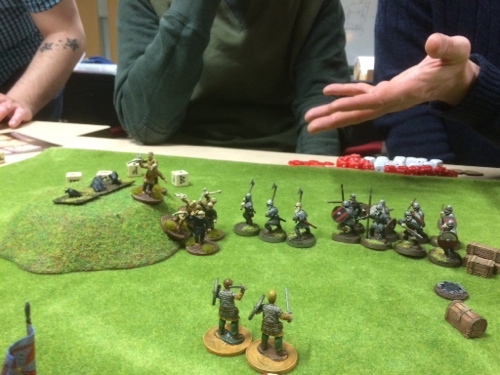 Axes clash and a huscarl falls. But the Viking Champion also stumbles and is hacked down, his body pushed without ceremony from the bridge. The champion's last stand gives Harald the time he needs to organise his defence. 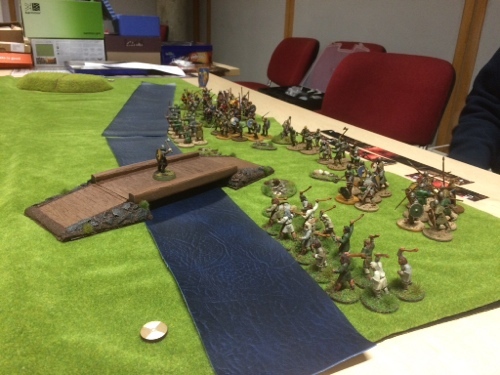 Slingers advance towards the bridge and unleash a volley of stones. 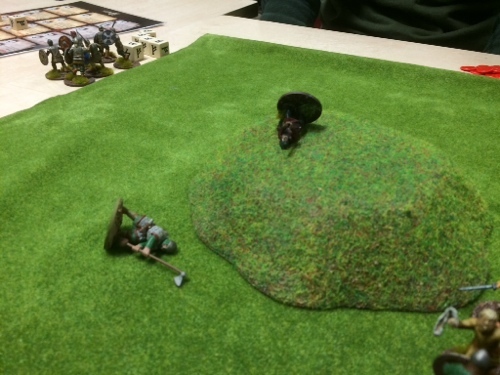 Two of the advancing huscarls are struck and killed! 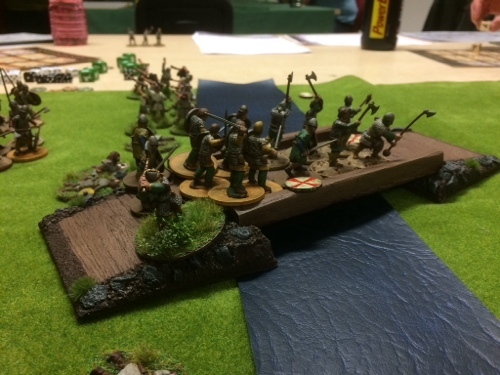 More huscarls and warriors rush across the bridge, leaping over the bodies of their fallen comrades. 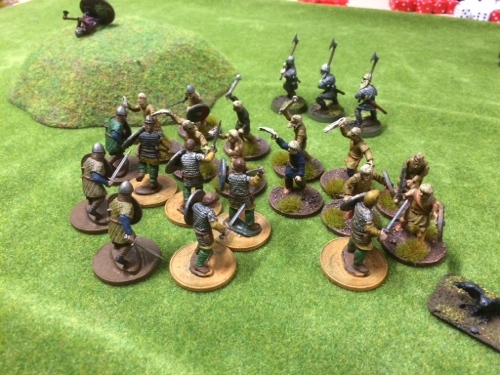 Meanwhile Harald reorganises his forces and edges away from the advancing Anglo Danes. Do the Vikings want to fight or flee? Ignoring their more cautious kinsmen, Harald's berserkers work themselves up into a frenzy and start to advance over a low hill. Seeing the danger, a unit of Anglo Dane huscarls unsling their Dane Axes and charge! The berserkers are cut down, but at what cost? The Anglo Dane huscarls all lie dead around the hill. 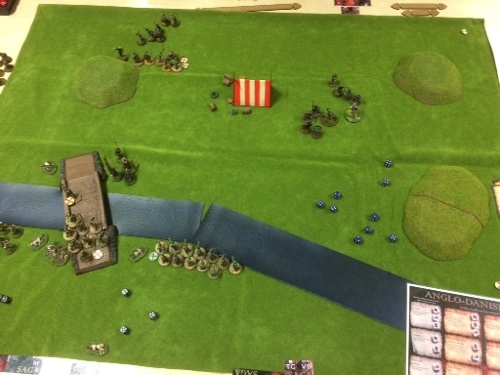 Anglo Dane warriors rush from the bridge and throw themselves at the Viking slingers. The levy are beaten and fall back, but only two warriors remain standing. Before them, Tostig's berserkers start to froth... The warriors look at each other and the fear of Loki sinks into their bones as they flee from the field of battle. 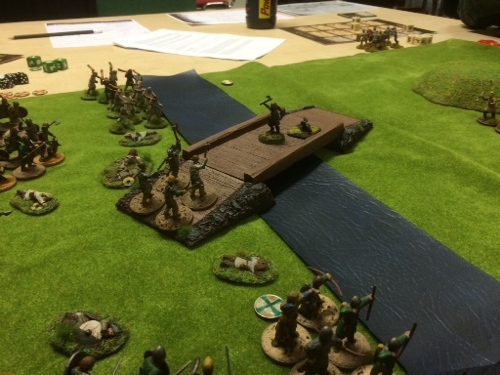 Harold's personal guard and Ceorls finally get across the bridge and start to form a Shieldwall. But the Northmen still refuse to fight and continue to shuffle away from their camp. 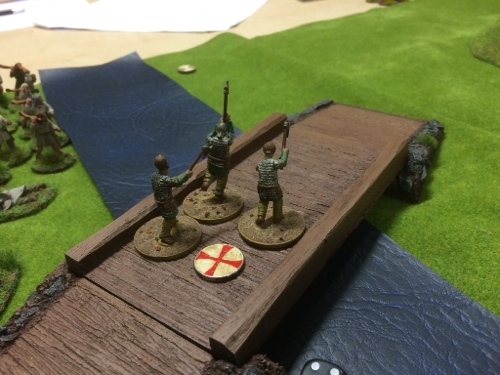 Harold and his remaining warriors stride across the bridge. As the Anglo Dane Shieldwall starts to form and slowly advance towards the enemy lines, a loud shriek is heard. Two berserkers are immediately sent to Valhalla. 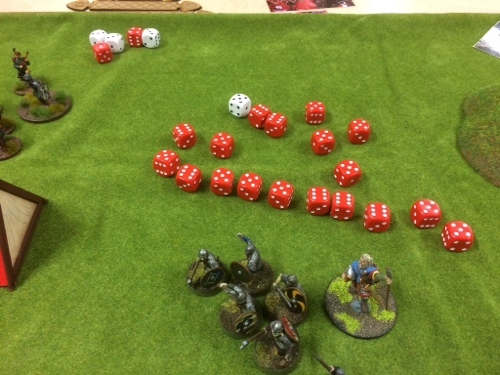 The attack dice are rolled and the Pagan gods speak! Seven warriors fall and the Shieldwall crumbles, but three warriors live to tell the tale of how they skewered the remaining mad Norseman. 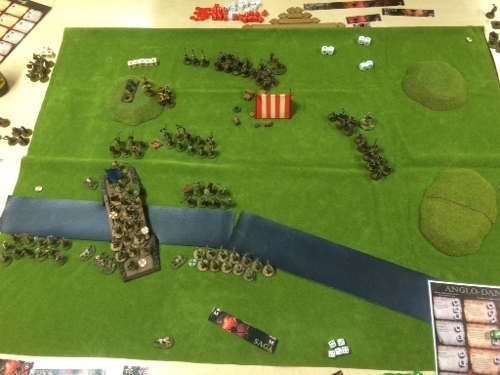 Another unit of Ceorls rushes the exhausted Viking slingers and survive a counter strike by nearby warriors. 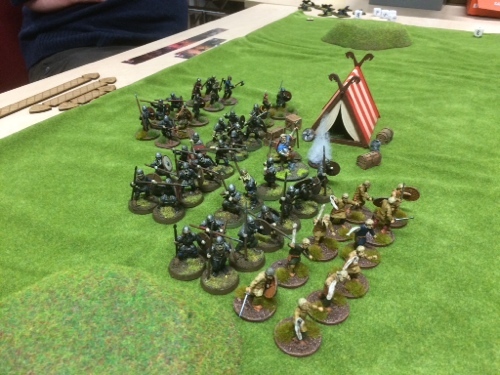 Suddenly, the reason for Harald's apparent reluctance to fully engage his troops becomes clear as Viking warrior reinforcements arrive on the Battle Flats. 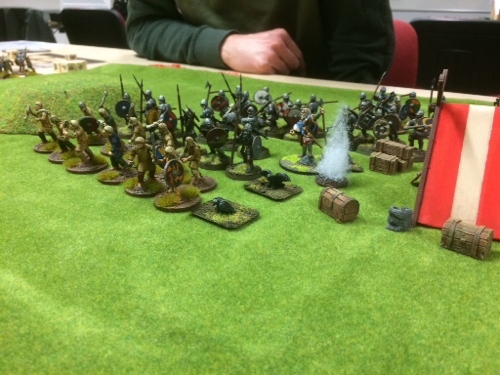 Whilst warriors from both forces clash shields, elsewhere Harold's personal guard charges Tostig's warriors. The warriors are hewn, but Tostig is uninjured. Seeing the huscarls waver, Harald and his Varengian guard fall upon the remaining hearthguard. The huscarl falls before the onslaught, but he takes two Hirdmen to the grave with him. More men start to pour across the bridge but as the light fades both forces look to their losses. 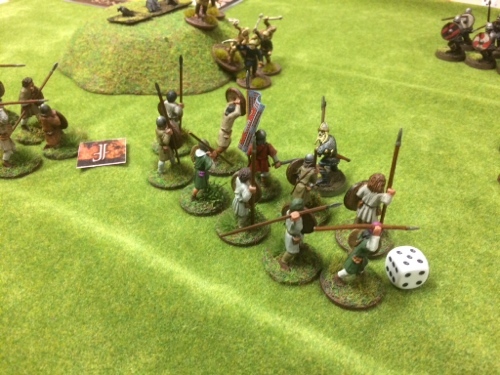 Harold Godwinson and his Earl are uninjured. But Harald and Tostig stand defiant. 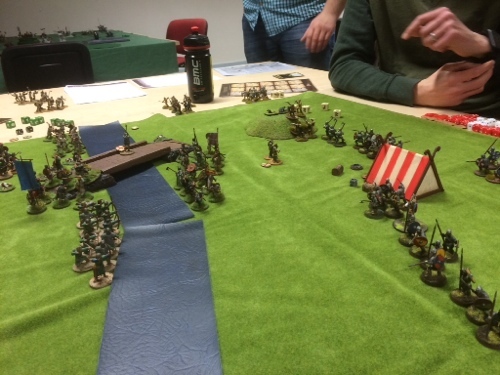 The Anglo Danes scored 26 slaughtering points against the Viking 29. As he retreats to his longship with a Minor Victory, Harald Hardrada reflects on what may have been. His ambitions for the throne of England may have been thwarted, but the Skalds will tell stories of his victory at Stamford Bridge. Harold Godwinson gathers his surviving men and heads back towards York. The Viking invasion has been repelled but there is a feeling of disquiet. As he enters the city, the local fyrd avert their gaze. When word reaches Harold that a Norman invasion force has landed on the south coast he sends out word for men to join him once again in battle. Another great game at Friday Night Firefight Club with big thanks to David, Dan and Mike for helping dish out the pain! Due to time constraints we had to play this game without some of the scenery elements I would normally use (hence the lack of road and simple river). It didn't spoil our enjoyment of the game though. The scenario worked pretty well. It was clear that the Vikings had decided to forgo achieving a Major Victory (they would have needed to kill Harold Godwinson) and were sitting back in the hope that their reinforcements would help save the day. And it worked! 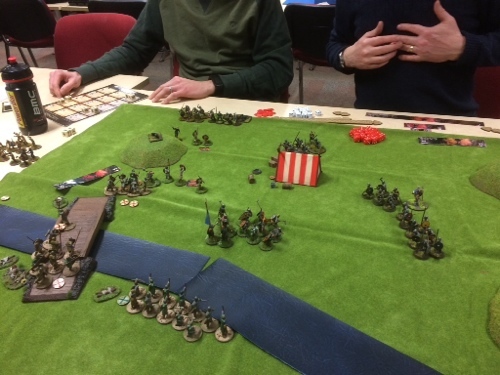 By managing their losses and tempting the Anglo Danes forward, the Vikings were able to achieve just enough slaughtering points to secure a Minor Victory. Harald Hardrada may never become King of England but he sails back to Norway with his pride intact. Although it's anyones guess what will then happen to Tostig!